A post-Christmas decision about when to take the tree down was easier than usual for a home in Northwest after the homeowner found bugs on her live, fresh-cut tree. WASHINGTON — A post-Christmas decision about when to take the tree down was easier than usual for a home in Northwest after the woman who lives there found bugs on her live, fresh-cut tree. “I am known to be very afraid of spiders, so it was quite a day for me,” the homeowner told WTOP. The bugs turned out to be aphids, which are harmless but look similar to ticks and spiders. After spending a few days away for the holiday, the woman says she returned home to discover the creatures in her living room, bathroom and bedroom. She tracked the bugs back to the Christmas tree. 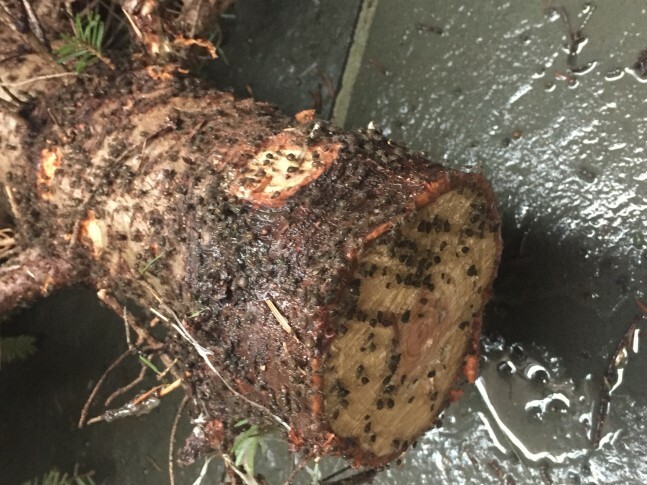 “I pulled the tree out of the house and when I dropped the tree to the ground hundreds of [aphids] went running across the concrete — it was terrifying,” she says. The Whole Foods Market on P Street Northwest, where she bought the tree, has been very accommodating, according to the woman. Workers retrieved the tree from the Logan Circle home for recycling, gave her a refund and offered to help pay for an exterminator. While unpleasant to come home to, the homeowner says she sprayed the bugs herself and was able to fix the problem. The Penn State Department of Entomology also believes people shouldn’t be overly concerned about pests brought into the home on Christmas trees. “Every Christmas tree can harbor insects, mites or spiders. Some of these may remain on the tree into winter and could become active after being exposed to the warm temperatures inside the home. Although many will stay on the tree, a few may be attracted to sources of light, including windows. But, because they are associated with field-grown conifers, none of these accidental introductions are a threat to your home, its contents or occupants,” the University’s website says. “While trees are treated naturally in the field, it doesn’t always take care of them 100 percent,” Gross said. Those less-than-sure odds are unfortunate, especially considering that the charm of a live Christmas tree is now lost on this homeowner.